Anne the Wife and I gots the two kids: one is 5 years old, the other is 11 months. Turns out neither of them can be trusted to cook, bathe, and/or get themselves ready for bed on their own, so we pretty much close up shop after 6pm for family stuff. By the time we get those two tiny humans fed, cleaned up, and to sleep, Anne and I basically collapse from the day only to get up the next morning to start all over. A couple weeks ago Anne and The Boys were out of town a few days and I made it a point to be out after 8pm. That's a freakin' double rainbow covered in unicorns around here so I lined up a shoot with an absolute BEAST of a dancer I met through Instagram named Emmett Prince. 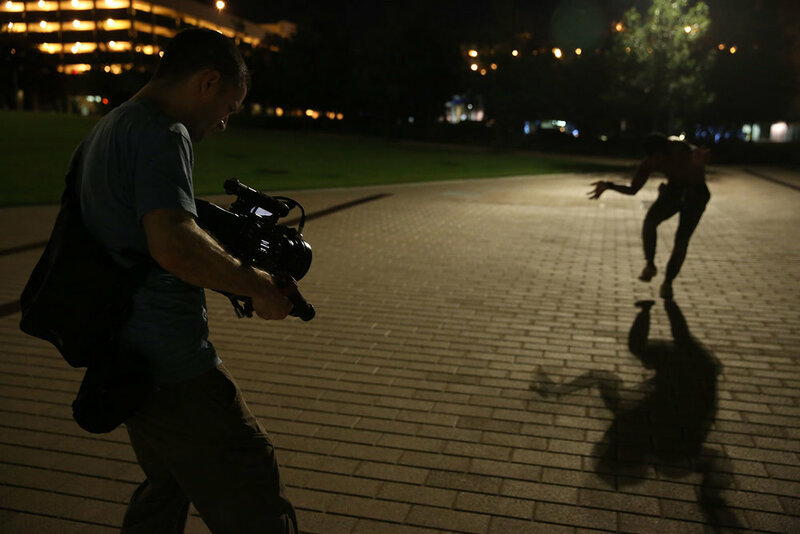 He's a dance student at the University of Central Oklahoma and was up to shoot around downtown Oklahoma City after dark with a couple complete strangers. Somehow I also wrangled another two filmmaker buddies of mine to help out on our shoot: John Dewberry is a saint and a kick arse AC; Steve Mathis's last real jobs were gaffing Black Panther and Thor: Ragnarok, so he basically just puts up with me. In getting all this nonsense together, I had a couple key reference images and videos plus I was listening to a ton of Frank Ocean and Anderson .Paak. 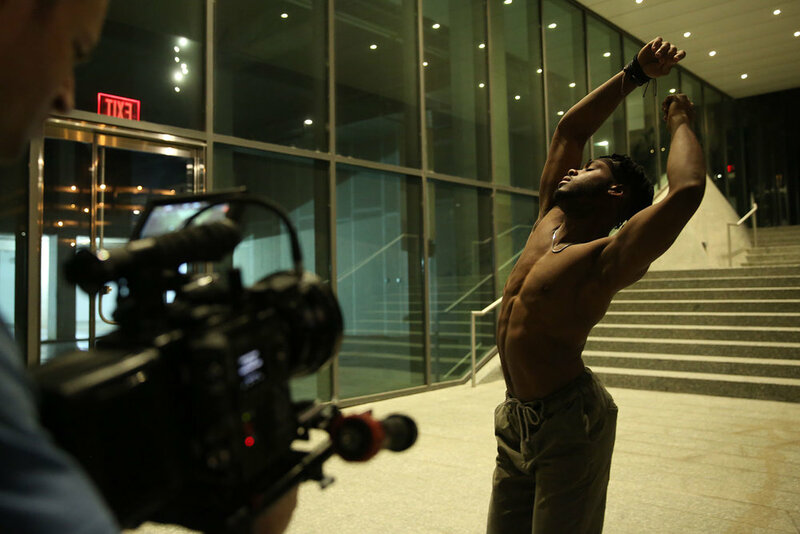 There wasn't a proper storyline, but I had the locations in mind and I wanted to work with a black male dancer in his early 20s. If you're up for it, here's the link to download the look book as well as the music playlist we used during the shoot. All the nervousness kicked in right before our 8pm call time and I was ready to puke in the parking lot just to get it over with. The three guys on the project were donating their time and I made sure to keep the shoot under two-ish hours total with a round of drinks on me afterwards. I'd scouted earlier in the week and lucked out with all of the locations being pretty close to each other. The look at the first location didn't end up working and we only made it to three of the other five locations I had in mind. The footage we were getting felt right and I had no problem nixing the other two spots so we could keep within the promised time frame. Crazy thanks to John the AC for snapping some behind the scenes pics at our last location. There's always the urge to just throw money at a project and this one was no different. That being said, I didn't have the money to throw at it. And two, I know through personal experience that throwing money at a thing isn't always the best solution. The goal was to shoot this project in a way where I was participating with the talent vs. simply observing them at a distance. This could've been a great situation to break out my Steadicam setup, but I knew I'd need to rent out a wireless follow focus and monitor package for my AC. An EasyRig would've been IDEAL to balance out a handheld look and not straight up kill my back, but again I'd need to rent one of those. "No self-respecting Director/DP would go into creative battle without the proper tools," right? I'd packed my Steadicam but ended up not using it after only a few minutes – the camera angles just weren't right; Thank goodness I didn't drop the money on a wireless follow focus and monitor kit rental. I'm not going to say an EasyRig wouldn't have been helpful, but not shooting with one actually freed me up to try camera angles and movements that I wouldn't have otherwise. One key piece of additional gear was a battery powered Bluetooth speaker. I've done shoots with music sputtering out through my iPhone, but the sound quality and volume is passable at best. We used a JBL Flip 4 connected to my phone and it worked like a champ. The burrito sized speaker was loud enough, sounded great, and the setup was dummy-proof. Either John the AC was holding it or I had it clipped to the small messenger bag I had on me throughout the shoot. For the gear-heads, we shot with my RED Weapon Helium at 8k widescreen and ether 60 or 48 frames/second depending on the light levels. In terms of lensing, my 25mm Zeiss CP.2 emphasized the on-screen talent and his performance, but didn't separate him from the locations like a tighter lens would. I swear if I were forced to choose between a 25mm lens or food and water, I'd still pick food and water but I'd have to think about it for a minute. We were shooting with existing light at each location so we tested to make sure we weren't getting a flicker fight between shutter speeds and the light fixtures. The first two locations had no beef with a typical 180° shutter, but at one point we had to break out John's FLICKERfree Calculator app and adjust accordingly. Knowing that we'd be dealing with lower light levels, I evicted the Standard OLPF that's set up camp in my RED for the Low Light version. It’s the first time I'd used it so I made sure to check out test footage online beforehand – which for the most part ended up being a waste of time. There's very few situations where I'd use the Skin Tone-Highlight OLPF, but I feel like the Low Light optimized version helped to give me just a bit more light, especially with my T2.1 lens and shooting around ISO 1600-2000 on the high end. All of this footage is straight out of camera BTW using RED's RedGamma 4 / Dragon Color 2 look – which I absolutely dig. Given the opportunity, I'd love to see what a qualified colorist could do with the raw .r3d files.